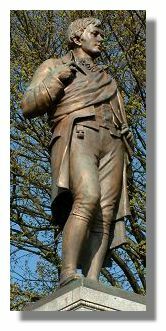 Born on January 25th, 1759, Robert Burns was the eldest of seven children brought up in a thatched cottage in Alloway, two miles from Ayr. His father, William Burnes (the spelling of the family name was later changed) was a gardener and his mother, Agnes Broun, a farmer's daughter from Kirkoswald. By the time he was 21 he had read Shakespeare, David Hume and many other great writers and philosophers. He was a freemason and a talented debater, raconteur and wit as well as an outspoken critic of the church and land-owning gentry. Burns began writing poetry after the death of his father, drawing from his wide experience of people from all walks of life in town and country. Rabbie Burns is important to us in Scotland - and undoubtedly an international celebrity, especially in Russia and North America. He has an enduring, romantic, universal appeal. Every year on January 25th, admirers across the world join together at Burns suppers to raise a glass and toast the haggis as part of our reverence to such an inspirational man. Now in its fourth year, this is a key annual event taking place in and around Ayr - a week long programme of poetry, debate, music, songs, dancing and whisky tasting. It aims to be both a celebration of Burns' life and work but also a platform for established and younger poets, musicians, actors and performers who carry on his legacy across our diverse contemporary Scottish culture. The festival is funded by Visit Scotland, EventScotland, Scottish Enterprise Ayrshire and South Ayrshire Council. It's the brainchild of Pete Irvine of Unique Events, the company that has done so much to develop Edinburgh's Hogmanay party and Capital Christmas Wonderland. This has clearly brought many visitors to Edinburgh for the festive season. Over on the west coast of Scotland, Irvine is delighted at the continuing success of the Burns an' a' That festival: "The growth of the festival has been phenomenal. Once again artists from the UK, the US and here in Scotland, inspired by Robert Burns, will participate in a unique cultural showcase. Our programme may be controversial or at least unpredictable but it will appeal to a broad range of audiences." 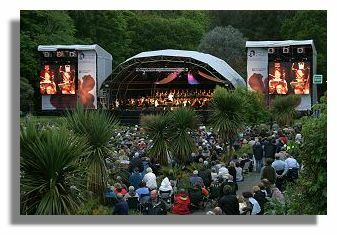 The Burns Festival 2005 begins on Friday 20 May with the Gala Concert at the spectacular Culzean Castle set high on the cliff top where an outdoor stage is created in the gardens. The great American singer-songwriter Lou Reed will head the bill. Lou Reed's career has spanned 30 years, producing many of the greatest albums and songs of all time, not least his recent Top 10 single success with the dance remix of 'Satellite of Love' in the UK in 2004. 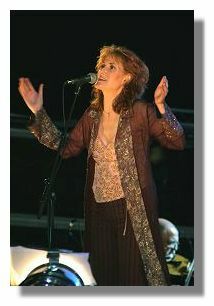 The legendary musician from New York will perform alongside the Orchestra of Scottish Opera, together with a host of other fine performers including some of Scotland's most successful musicians Dougie MacLean, Eddi Reader (pictured here), Duncan Chisholm and Phil Cunningham. More for family entertainment is "Burns - The Musical" which sounds great fun. A play with music, traditional and new songs, including modern day Burns from composers and artists such as Andrew Lloyd Webber, Lynyrd Skynyrd, the Commitments and Eva Cassidy. There's a host of Fringe events such as Vegas! Nightclub offering old style glamour and the Festival Funfair to ensure the festival is a community event for all ages. An audiovisual exhibition on the Life of Burns is at the Irvine Burns Club. Whisky an' a' That is a series of whisky tasting event hosted through the week by Bowmore, Tomatin and Bruichladdich Distilleries - informative chats and tasting from the people who care about whisky with a passion. An Afternoon of Fiddle Music and Song is a celebration of Burns, The Fiddle Player by young musicians from the Royal Academy of Music and Drama. 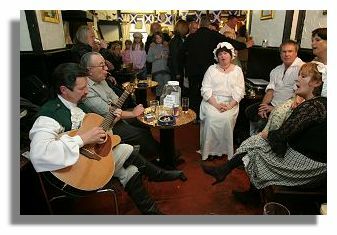 There are poetry picnics and Poems and Pints evenings at the Poosie Nansie's pub in Mauchline, featuring music, song and verse. A unique storytelling version of Burns' epic poem Tam O' Shanter will take place at Burns Cottage. A weekend of free music outdoors will take over Wellington Square, Ayr under the banner Fresh Ayr. Sure to draw the crowds is Blazin' Fiddles featuring Scottish singer-songwriters Eddi Reader, Justin Currie and Colin MacIntyre (of the Mull Historical Society). And ending the festival on 29 May is Scotland's top, hot band Aberfeldy and electro-punk musician Mylo. Hailed as the saviour of dance music, Mylo's debut album 'Destroy Rock & Roll' is one of the most critically acclaimed albums of 2004. And finally, recently polled in the List Magazine's 'Best Scottish Bands Ever' the Trashcan Sinatras arrive in Ayr after appearing at Southwest Festival, USA. Burns an' a' That 2005 will end with The Festival Fireworks. Robert Burns was a witty conversationalist, a ploughman and a poet. He was also a genuine and passionate humanist. For this aspect of his character he is commemorated in the Robert Burns Award, presented each year at the festival. The aim is to honour an exceptional individual, someone who has contributed greatly and achieved significant recognition of his or her humanitarian work. This is an international award and the recipient is selected after careful debate by a panel of prominent Scots with a background in arts, culture and especially Burns` life and work. The 2004 award was presented to Clive Stafford-Smith at the Royal Bank of Scotland Gala Concert at Culzean Castle. During a 20-year career, Stafford Smith has represented dozens of clients in capital trials in the southern states of the US including the appeal case of Edward Earl Jones, a Mississippi man on Death Row. He is currently defending more than 40 cases, earning just £15,000 a year and has represented all five Britons who have faced execution in the US since 1995. Previous winners include Sir John Sulston (2002), the Pioneer of the Human Genome Project, and Yitzhak Frankenthal (2003), co-founder of The Parent's Circle which represents bereaved families campaigning for peace in the Israeli-Palestine conflict.